This document describes the use of HTTP operations for the purpose of managing a collection of graphs in the REST architectural style. This is a Last Call Working Draft. The end date of the Last Call review period is 29 July 2011. The following is a summary of the major changes made from the last publication. The term Network-manipulable Graph Store was replaced with Graph Store. Support for indirect identification of the default graph was added. The behavior of HTTP PATCH was clarified. The retrieval of service descriptions has also been clarified. The status codes expected in response to specific behavior has been expanded. The general behavior of PUT and POST has been clarified. The term 'RDF knowledge' has been replaced with 'RDF graph content.' Graph IRIs specified via query components must be absolute (support for base resolution has been removed). The specification title has been changed to 'SPARQL 1.1 Graph Store HTTP Protocol.' Examples have been made more consistent across the document and more details regarding the actual HTTP messages and responses have been added to them. This specification relies on an intuitive interpretation of the underlying HTTP protocol semantics to determine how the RDF graphs are modified. Where the meaning of the operations are described, an SPARQL Update equivalent syntax is shown for clarity. The SPARQL 1.1 Query specification, which extends the first SPARQL query language specification. The SPARQL 1.1 Update specification, which describes an update language for RDF graphs. The SPARQL 1.1 Protocol specification, which extends the SPARQL Protocol specification. The SPARQL 1.1 Service Descriptions, a method for discovering and vocabulary for describing SPARQL services made available via the SPARQL Protocol. Graph IRI - An IRI involved in this protocol, specified as a request URI or embedded as the query component of a request URI, and corresponds to the IRI of a graph in the underlying Graph Store. RDF graph content - An information resource identified by the graph IRI of a named graph and managed by a server that implements this protocol or identified by an indirect operation on the default graph. See [WEBARCH] for further discussion on Resources. Implementations of this protocol are HTTP/1.1 servers [RFC2616] MUST interpet request messages as graph management operations on an underlying Graph Store where the subject of the operation is indicated through the use of a Graph IRI. In this way, the server would route operations on a named graph in an Graph Store via its Graph IRI. However, in using a URI in this way, we are not directly identifying an RDF graph but rather the RDF graph content that is represented by an RDF document, which is a serialization of that graph. Intuitively, the set of interpetations that satisfy [RDF-MT] the RDF graph that the RDF document is a serialization of can be thought of as this RDF graph content. The diagram illustrates this distinction. This diagram illustrates the basic kind of operation where the request URI identifies the RDF graph content being manipulated over the protocol. In the example above, the embedded graph IRI (http://www.example.com/other/graph) is percent-encoded [RFC3986] and indirectly identifies RDF triples to manipulate. Any server that implements this protocol and receives a request URI in this form SHOULD invoke the indicated operation on the RDF graph content identified by the IRI embedded in the query component where the IRI is the result of percent-decoding the value associated with the graph key. The embedded URI MUST be an absolute URI and the server MUST respond with a 400 Bad Request if it is not. The diagram below illustrates this. As indicated in section 3.3 of [RFC3986], the path component (of a URI) contains data, usually organized in hierarchical form, that, along with data in the non-hierarchical query component, serves to identify a resource within the scope of the URI's scheme and naming authority. So, the full request URI identifies the same RDF graph content as does the URI embedded in the query component that is managed by the authority. This section describes the use of the HTTP verbs to determine the operations performed on RDF graph content. In places where an equivalent SPARQL Update operation is given, <graph_uri> is understood to be either the request URI or the URI indirectly specified via the query component as described above. Similarly, in the case of an operation that manages the default graph, the SPARQL Update operation will not include any mention of a graph. For operations involving an RDF payload (PUT and POST), the server MUST parse the RDF payload according to media type specified in the Content-Type header (if provided in the request). If this header is not provided, the server SHOULD attempt to parse the RDF payload as RDF/XML. Similarly, if the Accept header is not provided, the server SHOULD return an RDF XML document. Developers of implementations of this protocol should refer to [RFC2616] for additional details of appropriate behavior beyond those specified here. Section 5 only serves to define the behavior specific to the manipulation af RDF graph content. For example, conditional requests that make use of headers such as If-Modified-Since that are intended to reduce unnecessary network usage should be handled appropriately by implementations of this protocol per [RFC2616]. In response to requests to the graph management operations specified in this protocol, implementations MUST include a status code [RFC2616] appropriate for the operation indicated and the result from invoking the operation. For example, in response to operations involving a RDF payload, if the attempt to parse the RDF payload according to the provided Content-Type fails then the server should respond with a 400 Bad Request. A request using an unsupported HTTP verb in conjunction with a malformed or unsupported request syntax should recieve a response with a 405 Method Not Allowed. If the RDF graph content identified in the request does not exist in the server, and the operation requires that it does, a 404 Not Found response code SHOULD be provided in the response. Either the request or the encoded URI (embedded in the query component) identifies the RDF payload enclosed with the request as RDF graph content. The server MUST NOT attempt to apply the request to some other resource. If the identified RDF graph content already exists, the enclosed entity SHOULD be considered as a modified version of the one residing on the origin server. If the identified RDF graph content does not exist and that URI is capable of being defined as new RDF graph content by the requesting user agent, the origin server SHOULD create the RDF graph content with that URI in the underlying Graph Store. DROP is needed to remove any previous RDF graph content. Developers should refer to [SPARQL-UPDATE] for the specifics of how to handle empty graphs. In particular, if the request body is empty and there is sufficient authorization to create a new named graph with an IRI of that indicated by the request URI, then an empty graph would need to be created. If new RDF graph content is created, the origin server MUST inform the user agent via the 201 Created response. If existing RDF graph content is modified, either the 200 OK or 204 No Content response codes SHOULD be sent to indicate successful completion of the request. If the resource could not be created or modified with the Request-URI (perhaps due to security considerations), an appropriate error response SHOULD be given that reflects the nature of the problem. A request that uses the HTTP DELETE method SHOULD delete the RDF graph content identified by either the request or encoded URI. This method MAY be overridden by human intervention (or other means) on the origin server. If there is no such RDF graph content in the Graph Store, the server MUST respond with a 404 Not Found response code. A response code of 200 OK or 204 No Content SHOULD be given in the response if the operation succeeded or 202 (Accepted) if the action has not yet been enacted. However, the server SHOULD NOT indicate success unless, at the time the response is given, it intends to delete the RDF graph content or move it to an inaccessible location. In the event the operation is overridden, a response code of 403 Forbidden should be returned. Date: .. some date ..
Last-Modified: .. some date ..
Where <new_uri> is a new URI that is designated by the service, is different from http://www.example.com/rdf-graphs, does not correspond to an existing graph IRI in the store, and is returned as the value of the Location HTTP header along with a 201 Created code. This scenario is useful for situations where the requesting agent either does not want to specify the graph IRI of a new graph to create (via the PUT method) or does not have the appropriate authorization to do so. If the graph IRI does not identify either a Networked-manipulable Graph Store or RDF graph content, the origin server should respond with a 404 Not Found. This protocol is a companion to the use of SPARQL Update over the SPARQL protocol which uses HTTP POST to transmit a SPARQL Update request. Both protocols specify different operations performed via the HTTP POST method. A request that uses the HTTP GET method SHOULD retrieve an RDF payload that is a serialization of the named graph paired with the graph IRI in the Graph Store. The response to such a SHOULD be made cacheable wherever possible and in any of the preferred representation formats specified in the Accept request-header field. In the event that the specified representation format is not supported, a 406 Not Acceptable response code should be returned. Information resources are resources with essential characteristics that can all be conveyed in a message [WEBARCH]. 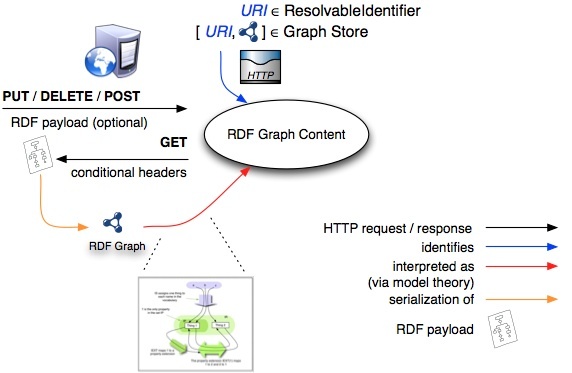 In this case, the characteristics of RDF graph content can be conveyed as RDF payload which serializes the named graph paired with the graph IRI in the underlying Graph Store. This protocol provides a means for requesting the representation without the need for indirection at the protocol level even if the naming authority associated with the URI of the named RDF graph in the Graph Store is not the same as the server managing the identified RDF graph content. When used in this protocol, the HTTP HEAD method is identical to GET except that the server MUST NOT return a message-body in the response. It is meant to be used for testing dereferencable URIs for validity, accessibility, and recent modification. The response to such a request from a server that manages a Graph Store MAY be cacheable. If the new field values indicate that the cached RDF graph content differs from the current entity (as would be indicated by a change in Content-Length, Content-MD5, ETag or Last-Modified), then the cache MUST treat the cache entry as stale. The IETF specified Patch Method for HTTP can be used to request that a set of changes described in the request entity be applied to the named graph associated with the graph IRI of the RDF graph content resource identified by the Request-URI. Intuitively, the difference between the PUT and PATCH requests is reflected in the way the server processes the enclosed entity to modify the RDF graph content given by the Request-URI. In a PUT request, the enclosed entity is considered to be a modified version of the RDF graph content stored on the origin server, and the client is requesting that the stored version be replaced. With PATCH, however, the enclosed entity contains a set of instructions describing how the RDF graph content residing on the origin server should be modified to produce a new version. It is RECOMMENDED that the OPTIONS and GET methods be used in a request whose URI identifies the service that implements this protocol in order to retrieve information about the features of the service. Per section 2 of SPARQL 1.1 Service Descriptions, it is RECOMMENDED that a service description document be returned from such a request, especially if the implementation also supports the SPARQL Protocol for RDF. This can aid a web agent in the client-side creation, and use of request URIs for the discovery and augmentation of an underlying Graph store by dispatching RDF documents to its content via HTTP operations. SPARQL Query Language for RDF , E. Prud'hommeaux, A. Seaborne, Editor, W3C Recommendation, 15 January 2008, http://www.w3.org/TR/2008/REC-rdf-sparql-query-20080115/ . Latest version available at http://www.w3.org/TR/rdf-sparql-query/ . - Removed use of 'extension' vocabulary to describe components of Graph Store protocol model. removed reference to Network-manipulable Graph Store and changed SPARQL Update examples to account for default graph management semantics.